The Magic Master® QLA™ is the Ultimate Quick-Load A Frame Sidewalk/Curb Sign. The sign channel accepts virtually any 24" x 36" x 4mm or 3/16" substrate and allow sign panels to be changed quickly. "EZ Lock" feature offers security. The curved sign face deflects winds of up to 30+ mph. 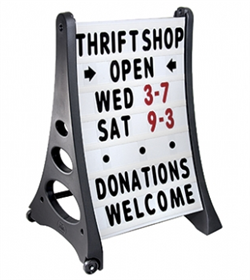 Tip 'n Roll (built in wheels for easy movement) feature allows sign to be moved easily with no lifting or carrying. Great in wet weather! QLA™ Sidewalk signs are made from rustproof techno-polymers with internal steel supports for durability and stability in rainy or windy conditions. Its narrow 29" (736mm) profile easily fits through any door. 29" x 42" x 24" QLA™ Rolling, changeable sidewalk/curb Message Board sign with 2 - 7 line 24" x 36" white sign faces with 4" characters. 2-sided. Fast assembly. 2 - 24" x 36" x 0.5" (600 x 900 x 10mm) white sign faces with letter tracks. 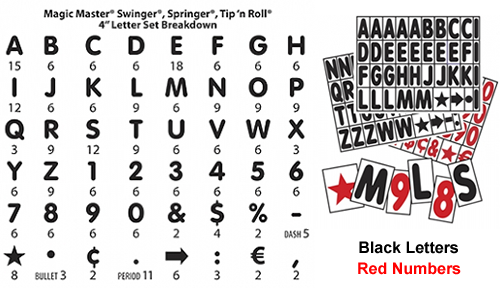 1 - set of 314 - 4" letters, numbers and symbols (Black letters, Red numbers). 2-Black sign uprights - one with wheels, one without. Set of 22 - 8'' numbers with % Set of 2 - 9'' double-sided headers, ''SALE/Special'' Red Lettering on White back panels. For Magic Master Products. Set of 314 - 4" letters, numbers and symbols, 22 - 8'' numbers with %, and 2 - 9'' double-sided headers, ''SALE/Special'' Black letters and Red numbers on White back panels. For Magic Master Products. Set of 314 - 4 inch Letters, Numbers, and Symbols. Letters are black and the numbers are red. Screen printed on a white styrene plastic panel. For Magic Master Products. I bought two of these signs for my business and they work great. Shipped like the same day I ordered. Highly recommend ya'll.